I like my friend Bruce for all the usual reasons one might like a friend. He’s funny, charming, smart, kind, and interesting. When we get started talking, we have a hard time stopping. He’s always learning a new language – I think Hungarian is the latest, probably spurred by meeting a beautiful Hungarian woman somewhere (if I know Bruce, and I think I do!) . Given the right venue – the presence of a Spanish-speaking woman – he will burst out in song, usually “Guantanamera” or “Cuando Calienta el Sol.” Those get the ladies, every single time. Bruce knows how to work a room. He is a massive flirt. We met in Toastmasters a long time ago and, even though we’re not in the same club anymore, we still exchange calls and mail and occasionally meet for coffee. What I love about him being 85 is that he gives me such hope for the future. I want to grow up to be as cool as Bruce. If I’m as witty, smart and on the ball at 85 as he is, I will count my lucky stars, and the numbers will be very, very high. For Bruce’s part, he’s aiming to be 101 years old. Or did he say 110? In either case, I hope I get to enjoy his company for many more years. 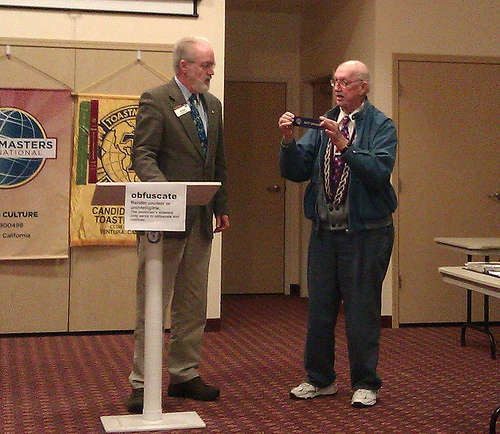 Bruce on the right, with another friend at Toastmasters.